Edited by Paco Barragán. Text by: Bernat Dedeu, Christiane Paul, Rirkrit Tiravanija, Pedro A. Cruz Sánchez, Slavoj Zizek, Gilles Lipovetsky, Gianni Vattimo, Simon Critchley. 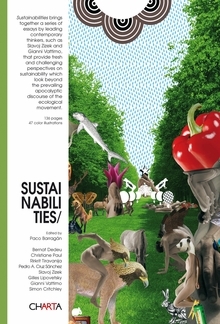 Sustainabilities brings together a series of essays by leading contemporary thinkers, such as Slavoj Zizek and Gianni Vattimo, that provide fresh and challenging perspectives on sustainability which look beyond the prevailing apocalyptic discourse of the ecological movement. Hardback, 6.25 x 9.25 in. / 136 pgs / 47 color.